The Minnesota Golden Gophers football program represents the University of Minnesota in college football at the NCAA Division I Football Bowl Subdivision (FBS) level. Founded in 1882, the program is one of the oldest in college football. Minnesota has been a member of the Big Ten Conference since its inception in 1896 as the Western Conference. The Golden Gophers claim seven national championships: 1904, 1934, 1935, 1936, 1940, 1941, and 1960. Since 2009, the Gophers have played all their home games at TCF Bank Stadium in Minneapolis, Minnesota. The team's current head coach is Tracy Claeys. The Minnesota Golden Gophers college football team played its first game on September 29, 1882, a 4–0 victory over Hamline University. Eight years later in 1890, the Gophers played host to Wisconsin in a 63–0 victory. With the exception of 1906, the Gophers and Badgers have played each other every year since then. The 124 games played against each other is the most played rivalry in Division I-A college football. The sport's beginnings were humble. Students began gathering to play the game recreationally and its popularity grew. The Gophers enjoyed quite a bit of success in the early 20th century, posting winning records from 1900 to 1919. Head coach Henry L. Williams developed the "Minnesota shift", a predecessor to later quick line shifts, which was adopted widely. Also Henry L. Williams led Minnesota to one of the NCAA's longest unbeaten streaks of 35 games, from 1903 to 1905 with 34 wins and 1 tie. In 1932, Bernie Bierman became the Gopher head coach and led the Gophers to their first dynasty. From 1934 to 1936 the Gophers went on a run of winning three straight National Championships, the last Division I team to accomplish this feat. During the run, Minnesota went unbeaten in 28 straight games, 21 of which were consecutive victories. The school record for consecutive victories is 24, which spanned 3 seasons from 1903 to 1905. The Gophers also won two more national championships in 1940 and 1941. Those two seasons comprised most of an 18-game winning streak that stretched from 1939 to 1942. After some mediocre seasons throughout the remainder of the 1940s and 1950s, the Gophers rose back to prominence in 1960 with their seventh national championship (because polling ended after the regular season, the Gophers were crowned AP and UPI national champions despite losing the Rose Bowl to Washington). That national championship followed a 1-8 record in 1958 and 2-7 record in 1959. Minnesota played in bowl games the two following years as well, in 1961 and 1962. The Gophers earned their first berth in the Rose Bowl by winning the 1960 Big Ten title. The following year, Minnesota returned to Pasadena despite a second-place finish in the conference. The Ohio State Buckeyes, the Big Ten champions in 1961, declined an invitation to the Rose Bowl because of tension between academics and athletics at the school. Minnesota beat UCLA 21-3 to claim its first and only Rose Bowl victory. Minnesota's last Big Ten title was in 1967, tying the Indiana Hoosiers and Purdue Boilermakers atop the standings. After their 8–2 record in 1967, the Gophers would not win 8 games in a season again until they went 8–4 in 1999. Their 10–3 record in 2003 gave the Gophers their first 10 win season since 1905. The 2006 team had the dubious distinction of blowing a 38–7 third-quarter lead in the Insight Bowl against Texas Tech, losing 44-41 in overtime. The collapse, which was the biggest in the history of Division I-A postseason football, directly led to the firing of head coach Glen Mason. On January 17, 2007, Tim Brewster was officially announced as the next head coach of the Minnesota Golden Gophers. In 1981, the Gophers played their last game in Memorial Stadium and played their home games in the Hubert H. Humphrey Metrodome until 2008. 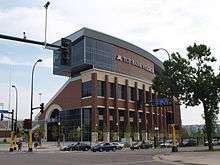 The Gophers moved back to campus with a 20-13 win against Air Force on September 12, 2009, when their new home, TCF Bank Stadium, opened. In 2010, after a 1-6 record to start the season, the Gophers football head coach Tim Brewster was fired. Jeff Horton served as the interim head coach going 2-3. On December 6, 2010, Jerry Kill, former Northern Illinois University head coach, was hired to take over the University of Minnesota football program. In 2014, The Gophers reached an 8-4 record while going 5-3 in Big Ten games, falling just short of making the Big Ten Championship Game by losing to The Wisconsin Badgers in the season finale. After being revitalized in the Big Ten contention, The Gophers were awarded an appearance in the Citrus Bowl on January 1 against Missouri. This is the Gophers football record against current Big Ten Conference opponents. The University of Chicago was a Big Ten Conference member from 1896 to 1946. The NCAA itself does not award a championship for Division I-A/FBS football. A number of different organizations and publications designate a national champion. The following are the national championships that Minnesota recognizes. Minnesota was a member of the short-lived Intercollegiate Athletic Association of the Northwest in 1892 and 1893 and won the conference title both seasons. Minnesota joined the Big Ten (originally known as the Western Conference) as charter members in 1896. TCF Bank Stadium is the football stadium for the Minnesota Golden Gophers college football team at the University of Minnesota in Minneapolis, Minnesota. The 52,525-seat on-campus "horseshoe" style stadium is designed to support future expansion to seat up to 80,000 people, and cost $303.3 million to build. The stadium was the temporary home of the Minnesota Vikings of the National Football League for the 2014 and 2015 seasons while U.S. Bank Stadium was being built. The complex is a state-of-the-art facility housing the team administrative offices, team locker room, team meeting rooms, equipment room, training room, and players’ lounges. Trophy: Paul Bunyan's Axe, Rival: Wisconsin Badgers, a Big Ten West Division Border Rivalry played since 1890 a total of 124 games played. Trophy: Floyd of Rosedale, Rival: Iowa Hawkeyes, a Big Ten West Division Border Rivalry played since 1894 a total of 108 games played. Trophy:Little Brown Jug, Rival: Michigan Wolverines, an Inter-Division Big Ten played since 1902 a total of 101 games played. Trophy: Governor's Victory Bell, Rival: Penn State Nittany Lions, an Inter-Division Big Ten played since 1993 a total of 13 games played. Trophy: *$5-Bits-O-Broken-Chair Trophy , Rival: Nebraska Cornhuskers, a Big Ten West Division Rivalry played since 1900 a total of 55 games played. Minnesota plays the other six Big Ten West opponents once per season. ↑ "Our Brand, How to convey it". umn.edu. Retrieved 2015-01-13. ↑ Men's Intercollegiate Athletic Department of the University of Minnesota (1981). Ralph Turtinen, ed. 100 Years of Golden Gopher Football. John Roberts. ↑ Mary Mapes Dodge, St. Nicholas: A Monthly Magazine for Boys and Girls, Volume 42, Part 1, p. 43, 1915. ↑ (http://fs.ncaa.org/Docs/stats/footba...s/2011/FBS.pdf - pp. 70-79)..
↑ Joe Nelson (October 28, 2015). "Jerry Kill retires from Gophers as seizures return: 'I love this game'". ↑ "Bruce Smith". heisman.com. Retrieved 21 February 2014. ↑ "Tom Brown". Football Writers Association of America. Retrieved 21 February 2014. ↑ "Bobby Bell". gophersports.com. Retrieved 21 February 2014. 1 2 "Greg Eslinger". Sports Reference LLC. Retrieved 21 February 2014. ↑ "Tyrone Carter". Sports Reference LLC. Retrieved 21 February 2014. ↑ "Matt Spaeth". gophersports.com. Retrieved 21 February 2014. ↑ "Bernie Bierman". afca.com. Retrieved 21 February 2014. ↑ "Murray Warmath". Football Writers Association of America. Retrieved 21 February 2014. ↑ "Murray Warmath". .gophersports.com. Retrieved 21 February 2014. ↑ "Biggie Munn". University of Minnesota Football. Retrieved 21 February 2014. ↑ "Pug Lund". University of Minnesota Football. Retrieved 21 February 2014. ↑ "Paul Giel". University of Minnesota Football. Retrieved 21 February 2014. ↑ "Tom Brown". University of Minnesota Football. Retrieved 21 February 2014. ↑ "Sandy Stephens". University of Minnesota Football. Retrieved 21 February 2014. ↑ "Greg Eslinger". gophersports.com. Retrieved 22 February 2014. ↑ "Karon Riley". ohiostatebuckeyes.com. Retrieved 22 February 2014. ↑ "Darrell Thompson". by STATS LLC and Associated Press. Retrieved 22 February 2014. ↑ "Laurence Maroney". bigten.org. Retrieved 22 February 2014. ↑ "Glen Mason". Sports Reference LLC. Retrieved 22 February 2014. ↑ "Marion Barber Jr". Pro-Football Reference.com. Retrieved 23 February 2014. ↑ "Phil Bengtson". Pro-Football Reference.com. Retrieved 23 February 2014. ↑ "Rene Capo". Sports Reference LLC. Retrieved 23 February 2014. ↑ "Gino Cappelletti". Pro-Football Reference.com. Retrieved 23 February 2014. ↑ "Gil Dobie". University of Washington. Retrieved 23 February 2014. ↑ "Tony Dungy". Pro-Football Reference.com. Retrieved 23 February 2014. ↑ "Verne Gagne". wwe.com. Retrieved 23 February 2014. ↑ "Tony Levine". uhcougars.com. Retrieved 23 February 2014. ↑ "Levy, Len "Butch"". jewsinsports.org. Archived from the original on December 5, 2010. Retrieved July 26, 2015. ↑ "Chip Lohmiller". Pro-Football Reference.com. Retrieved 23 February 2014. ↑ "Karl Mecklenburg". Pro-Football Reference.com. Retrieved 23 February 2014. ↑ "Cory Sauter". Southwest Minnesota State Athletics. Retrieved 23 February 2014. ↑ "Darrell Thompson". Sports Reference LLC. Retrieved 23 February 2014. ↑ "Rick Upchurch". Pro-Football Reference.com. Retrieved 23 February 2014. ↑ "DeWayne Walker". Jacksonville Jaguars, LLC. Retrieved 23 February 2014. ↑ "Murray Warmath". Sports Reference LLC. Retrieved 23 February 2014. ↑ "Norries Wilson". scarletknights.com. Retrieved 23 February 2014. 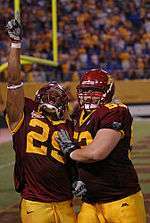 ↑ "Minnesota Golden Gophers Football Schedules and Future Schedules". fbschedules.com. Retrieved 2014-08-26. Wikimedia Commons has media related to Minnesota Golden Gophers football.